Tabriz Rugs are made in the city of Tabriz situated in the north west of Iran and is one of the largest cities in Iran and the capital of Azerbajdzjan. The azaris are the inhabitants of this city and is considered as the largest ethnic minority who speaks Turkish dialect. Tabriz has been the epi-centre of the rug making world for more than thousands of years. The rugs from Tabriz are unique and the design and quality varies due to high level of exposure to world trade for thousands of years. New designs and patterns from different parts of the world have been warmly welcomed by Tabriz weavers and incorporated the same with their own designs. Tabriz rugs are one of the most beautiful rugs in the world and the costliest. They have powerful red or blue colors with contrasting ivory background designs which are traditional and light green, blue and brown rugs to match the modern tastes and interiors. 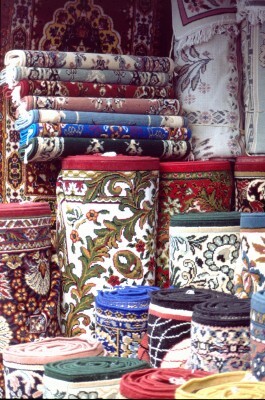 The art of rug and carpet making is passed on through generations and is considered as the valued heirloom. The designs of Tabriz rugs are taken from the works of ancient oriental poets which depicts images of falconry and ferocious lions and scenes of battles and pictures of mosques and palaces. All Tabriz carpets and rugs are made with fine soft wool and a dense knot range of 120 to 850 knots per square inch with a foundation made of cotton and wool piles. The most unique feature of these rugs is the color variations when light fall from different angles. The true mark of these rugs from Tabriz is the signature of the master weavers on the ceremonial border which is considered as the ultimate in formality and sophistication. Tabriz rugs come in different sizes and majority of the range varies from 4x6 feet to 8x10 feet. The materials used for the pile is mostly wool or silk or a combination of both. The most commonly found material in fine rugs are the blend of kurk wool and silk and in the finest of the rugs you will find pure silk instead of cotton. Gold threads of 18 to 24 karat are sometimes used for sophisticated rugs as the foundation. The master weavers of Tabriz are very open to new ideas and they have incorporated designs and patterns from other weavers. Today, rugs from Tabriz have more designs and shapes than any other Persian rugs worldwide. The color combination and pattern used in the rugs from Tabriz is what makes it superior than any other rugs from Persia. Oriental rugs should be purchased after understanding the origin and the procedure on how it is made, the materials used and the knots per square inch. The pattern and design should be chosen after taking these in to consideration so that once it is adorned on your wall or on the floor gives your surroundings an oriental feeling. Tabriz rugs with its oriental design and color and made from the finest wool and silk makes it the ideal choice for your homes. The Designs And Patterns Of Tabriz Rugs.